Maybe you’ve noticed an extra $200 mandatory fee upon paying for Spring courses. Perhaps you’ve even been asked to sign a petition against the fees, or to join a demonstration against the Board of Regents. What’s this all about? What can really be done about it? I’ll try to answer these two questions as succinctly as possible in the following paragraphs. First, the brass tacks: due to a budget gap, the Board of Regents (governing body of the University System of Georgia) approved two $100 mandatory fees in Spring and Fall of 2009, as well as more than 10% in overall budget cuts. According to the Board, students will fill 14% of the budget gaps and workers and management within the USG will fill the remaining 86%. This budget gap is no less than the product of a nearly 3-year long economic crisis that’s already touched all of us in some way, whether it be through wage/benefit cuts, unemployment, hour cuts, union-busting, or just being forced to work harder than usual. While details aren’t forthcoming about how our public universities will be affected in the long run, we can look to other campuses across the US for clues. In Tennessee and California, the crisis in public education funding has hit earlier (Tennessee lacks a state income tax and California had a serious budget gap that preceded the recession). 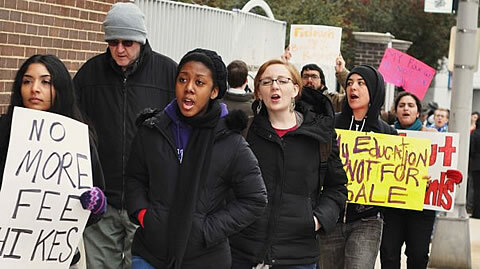 Students at Tennessee campuses, in early 2009, were told the departments would face closure and workers would be laid off. In response, hundreds of students converged on the state capitol to stage a “funeral” for public higher education, complete with caskets bearing each university’s name. The situation in California, which gained the attention of national media, was even more dramatic. 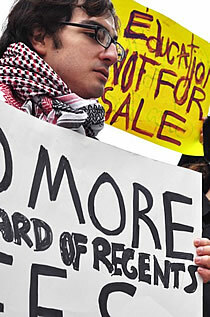 Students were told in Fall 2009 that tuition would rise 32% and workers would face layoffs. Very quickly, students and workers initiated a UC-wide strike that was punctuated by violent police reaction, mass arrests, and building occupations. In both states, the struggle continues and promises to be fueled by future threats and possibly by an emerging student movement across the nation. In our case at Georgia State University, fee hikes and furloughs are only the opening salvo in the attack on public education. The logic of this move was that this would be relatively simple. Though the Board is filled with politically influential men (and yes, practically all are men), they have no direct ability to raise funds from outside their institutional authority. While it would make more sense to cancel corporate subsidies as well as tax breaks and loopholes for the super-rich (you know, the folks that caused the crisis), it’s much easier to simply dip into the wallet of each and every college student in Georgia. What a system, right? Now let’s put this in an economic context, in order to chart the likely trajectory of this issue. We’ve heard the Wall Street gurus proclaim the “end” of the recession over the last month and, in a sense, they are correct. The market is rebounding, profitability is returning, and surviving businesses are recovering from massive losses. President Bush and Obama’s “trickle down” bailout had a lot to do with this, but workers had just as much role in facilitating the recovery. Workers did this through losing their jobs, wages, benefits, and working harder and faster than ever. For example, output per worker (average goods and services produced in a given time) jumped almost 10% just in the last quarter of 2009–such a leap hasn’t been recorded since 1945, the year we started measuring this statistically. So young workers, you who saw the highest unemployment (a post-WWII high at 53.4%, as of Sept. 2009) and likely dealt with more boss harassment than ever over the last 3 years, pat yourselves on the back–you saved capitalism from the coals! In lieu of a proper thank you from Wall Street, however, we’re being asked to pitch in just a bit more here and there. This is because the official recession that began in the private sector is sending tidal waves that will continue to affect the lives of students and workers for years in serious ways, and especially with regard to the public sector. As private sector profits fell from 2007-2009, so did income tax revenues across the US. Sales taxes were also drastically reduced, due to the inability of workers to consume in hard times. According to the Georgia Budget and Policy Institute, an excellent source on state budget issues, FYs 2009, 2010, and 2011 (predicted) will see continually declining budgets for the state. The effects will be seen in education (K-12 and higher), housing subsidies, transportation, health, and more, as budgets are cut and services are privatized. Without a doubt, the very nature of public education is at stake. Our own GSU President Becker, in his latest missive that arrived in every student inbox, foretold that the economic crisis “will bring change to how public education is structured and supported in the United States.” His prophetic utterances are on point, as any political economist would confirm. Public education will be re-structured in ways that limit waste (read: philosophy departments, women’s studies, and ethnic studies, generally the first to go in tough times) and “support” (he means funding) will increasingly come from user fees and partnerships with business, rather than state funding with democratic accountability. Bluntly put, this is creeping privatization–and it’s not easy to reverse. Can something be done about this at GSU? Yes, but only if students, parents, staff, faculty, and community members come together to build a movement in opposition to all threats to public education. They’ve let it slip that the recession is over (for the capitalists), so why are we still burdened with preserving their power? A small coalition called “Georgia Students for Public Higher Education” has formed, but the tradition of campus protest here is riddled with gaps and defeats. For this reason, students are starting from square one to spark a movement that can potentially bring in hundreds of affected students and allies from the “ground floor.” It’s my opinion that, due to the objective nature of the crisis in the public sector, there is great potential here to activate new leaders and to really educate about the logic of capitalism. Socialists, with their methodical understanding of capitalism, have much to contribute here, as long as it’s done patiently and respectfully. Even if victories can be won (and I’m not confident that this is right around the bend), people can’t know the limitations of capitalism without running directly up against them in clear terms. We as socialists aren’t even clear or of one mind on where these limitations might lie. But to find them, we must build institutions of struggle—even if they have modest beginnings, like at our campus—that can unite broad forces in opposition to a lean, jobless recovery that further liquidates the public sector in its wake. Furthermore, we must safeguard the independence of our struggle in order to not tail the deadly imperatives of the President Obama and the Democratic Party. Obama has recently out-done his far-right opposition by proposing a “spending freeze” for the discretionary budget, making the fight for the public sector even more dire. What has been your experience in public sector struggles? Are you hopeful or despondent? What demands motivate people in your sector or region?